Sandals resorts offers the absolute perfect way for each and every person to enjoy the unique and magical warmth of the Caribbean. From Sandals trademark romantic luxury-for-two to Beaches' amazing fun for the whole family and from the Royal Plantation's world-class perfection to Unique Villas' down-home sumptuousness-whatever your pleasure, you'll be sure to receive it all with Sandals. As a large-scale seller of Sandals resorts and Sandals vacations, we are able to offer you unbeatable prices and unparalleled value. Once you have found the discounted Sandals resort of your choice, please call our resort consultants at 1-800-340-8612 to book your vacation and save money with our first-rate personalized service! 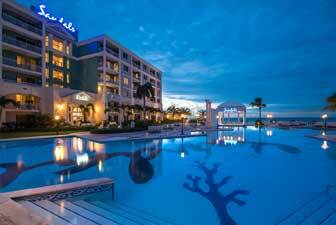 Book your Sandals resort today with AffordableTours.com, your discounted resort headquarters. 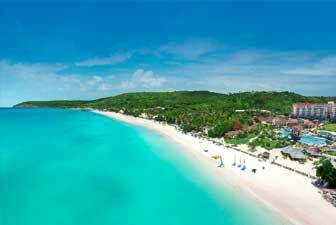 Location: Sandals Grande Antigua Resort & Spa is located on a twenty-seven (27) acre site situated on the island's most beautiful beach, Dickenson Bay. 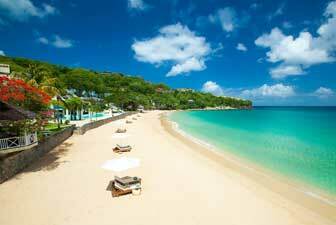 It is only 15 minutes from V. C. Bird International Airport and 10 minutes from Antigua's capital, St. John's. Location: 15 minutes transfer time from Grantley Adams International Airport. Sandals Barbados - one of the only all inclusive resorts on the seductive island designed exclusively for two people in love. Location: The Exuma Islands are a chain of 365 islands and cays that span hundreds of miles of clear blue water. Unfolding like a grand estate, Sandals Emerald Bay is a 500-acre resort set along a one-mile stretch of white sand beach. 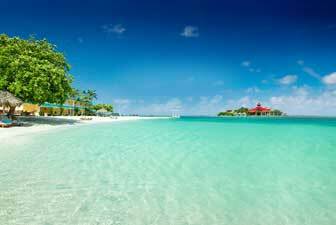 Location: Sandals La Source Grenada Resort & Spa is located to the south of the island on Pink Gin Beach Pointe Salines, St. Georges, Grenada, five  minutes from the Maurice Bishop International Airport [GND]. 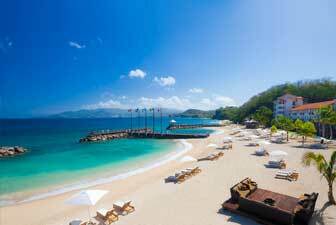 Sandals Resorts is thrilled to introduce the newest Luxury Included Resort, Sandals Grenada located in the Spice Island. Location: Situated in Jamaica's second city Montego Bay, Sandals Inn is located just 10 minutes away from Sangster International Airport on the east end of the famous Montego Bay "Hip Strip", in close proximity to downtown shopping, restaurants, bars and clubs. 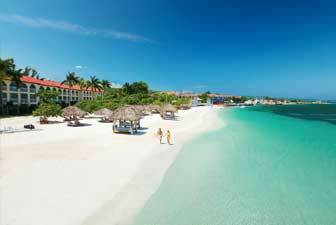 Montego Bay is the tourism mecca of Jamaica and is home to Jamaica's annual reggae festival "Sumfest." Ideal for active travelers and two people in love, this intimate resort provides authentic tropical vacation experiences while maintaining the secluded feel of a private island hideaway. Location: Located in Jamaica's Main Tourism Hub three miles east of Montego Bay, Sandals Montego Bay is 90 minutes away from Ocho Rios and its world famous Dunn's River Falls, only 5 minutes away from the Sangster International Airport and 10 minutes away from the town center. 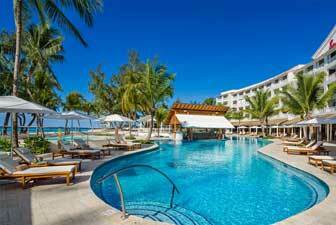 Location: Nestled on the northern shores of Jamaica, Sandals Royal Caribbean Resort & Private Island is located east of the city of Montego Bay. The resort is only 10 minutes from the Sangster International Airport and 1 and a half hours from the world famous Dunn's River Falls in Ocho Rios. Combining old-world Caribbean charm with British traditions of a bygone era, such as afternoon tea and breakfast in bed, this resort provides a romantic escape in a Georgian-style Great House setting. Location: Located on Nassau's renowned Cable Beach, approximately 10 minutes from Lynden Pindling International Airport and 20 minutes from Downtown Nassau and Bay Street. Approximately 30 minutes from Paradise Island. 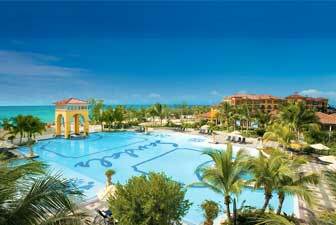 A luxurious all-inclusive resort that delivers leisure in an oasis of 'old world charm' and understated elegance. 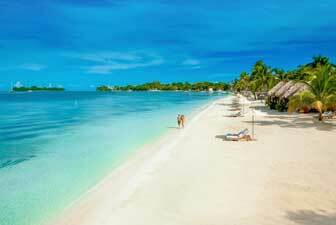 Location: Located on Negril's famous 7-mile beach on the Northwest Coast of Jamaica. 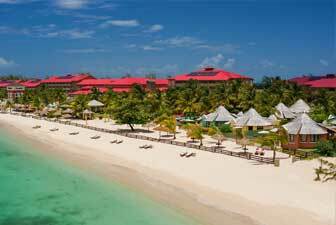 Approximately 1 Hour and 15 minutes from the Sangster International Airport. Fronting the longest and best stretch of Negril's famous Seven Mile Beach, this inspired resort offers the ultimate in personalized pampering and luxurious accommodations. Location: Located on the beautiful North Coast of Jamaica, Sandals Ochi Beach Resort is nestled between the lush mountains of St. Ann and the Caribbean Sea. 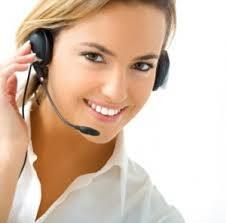 The resort is located approximately 1 hour and 45 minutes away from the Sangster International Airport in Montego Bay. Considered the true Garden of Eden, Sandals Ochi Beach Resort, the largest Sandals Resort, is situated on the slopes of over 100 acres of beautiful hillside gardens overlooking the Caribbean Sea. 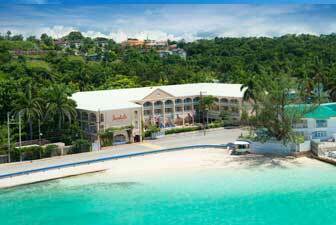 Location: Situated in Ocho Rios along the scenic Northern Coast of Jamaica. Ninety minutes by car from Sangster International Airport in Montego Bay and 15 minutes from the Ian Fleming International Airport (located in Boscobel). Sandals Royal Plantation, Sandals' first boutique resort, is an all-butler, all-oceanview suite resort located on dual cove beaches in Ocho Rios, Jamaica. Location: Located ten (10) minutes south of the capital, lies this exotic piece of paradise. 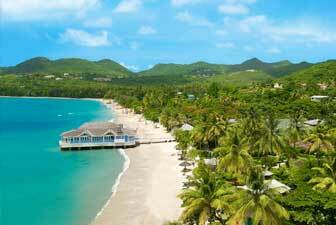 Nestled in one of the most historic parts of Castries, Sandals Regency La Toc Golf Resort & Spa in St Lucia is one of the most luxurious resorts filled with adventure, romance and relaxation. Set along a stunning stretch of white-sand beach and tropical gardens, golf enthusiasts and two people in love enjoy first-class, romantic vacation experiences during stays at this opulent island paradise. From the moment you arrive at this charming, Luxury Included getaway you will feel immediately relaxed and revived. Location: Approximately  miles Northwest of the city of Castries, on a causeway between Pigeon Island [National Landmark] and Rodney Bay. The resort will provide transfers from both the Hewanorra International Airport [UVF] 40 miles [1 hour 30 minutes] away and George F.L. Charles Airport [SLU] which is 6 miles  minutes away. On an island so simply beautiful the French and British fought over it for over 150 years, lies this unforgettably romantic, Luxury Included hideaway. 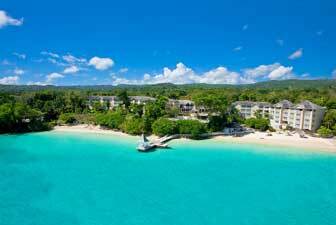 Location: Sandals Whitehouse is nestled in the south-west coast of Jamaica and is only approximately 90km and 75 minutes from the Sangster International Airport and 60 minutes from Negril.